On February 24, a union representing more than 8,000 Massachusetts workers at the supermarket chain Stop & Shop overwhelmingly voted to authorize a strike. The vote came just one day after the company’s three-year labor agreement with its employees expired. Stop & Shop is the largest grocery chain in New England. Kroger has made its latest bold move to win over U.S. grocery shoppers. The grocer is, for the first time, looking to an outside advertising agency to help oversee its marketing efforts. The move is the latest in a string of actions the grocer has taken to make sure shoppers know it is more than a local shop to pick up essentials. Kroger, founded at 66 East Pearl Street in Cincinnati, Ohio in 1883, has in the past two years eyed global and technological expansion. It bought meal kit company Home Chef and a stake in British online supermarket Ocado. It launched grocery delivery service Kroger Ship and struck a partnership with driverless car company Nuro. It inked a partnership with Walgreens in the U.S. and Alibaba in China. These are big moves for the grocer that first made its splash by being first to offer in-house bakeries and meat departments. They are also a different than the one previously forged by Kroger. 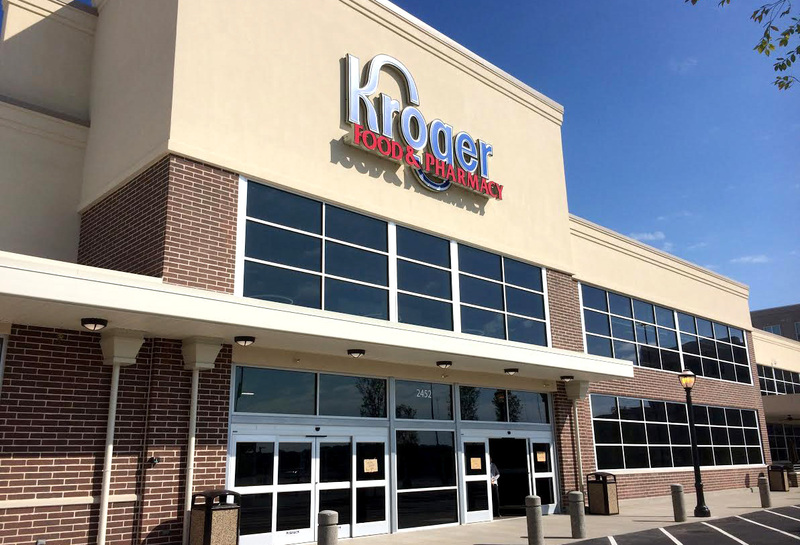 For years, Kroger spent money on growth, but the money was predominantly put toward buying competitors, not transforming its business. Previous deals include Harris Teeter and Fred Meyer. Scale gave it the power to navigate the infamously thin-margin grocery industry. But things changed over the past five years, and scale is no longer the singular defense. Shoppers increasingly like their food fresh, organic and natural. Amazon’s infiltration into the industry has forced all grocers to expedite their technology investments. Walmart has kept grocery a focus, even as its fortified its larger discount store business. Seventy percent of shoppers will be buying some portion of their groceries online within five to seven years, according to Nielsen. That equates to $100 billion in total sales. Changes have rippled throughout the industry. 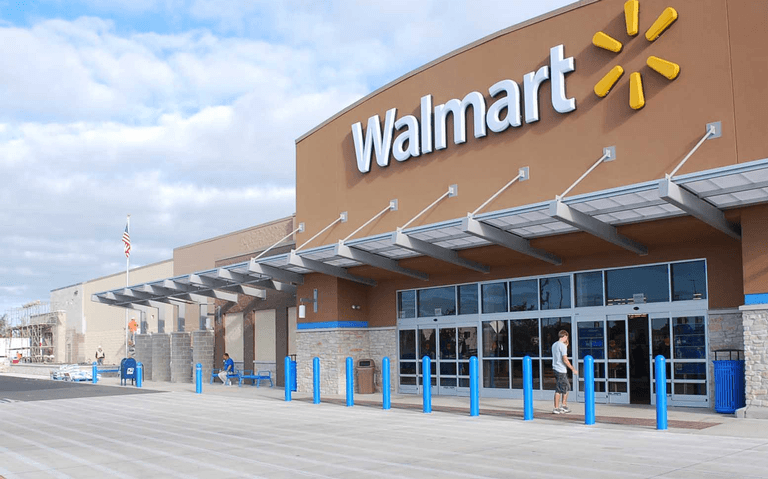 Walmart racing is reoutfitting its stores to support grocery delivery and racing to bring it to 1,600 locations by the end of fiscal 2020. Target, which has struggled with its grocery business, paid $550 million to buy same-day delivery service Shipt in 2017. So far, some of Kroger’s investments appear to have born results: shares of Kroger are up nearly 5 percent this year, giving it a market capitalization of $23 billion. Its digital sales grew more than 60 percent the third quarter of 2018. But that growth came at a cost: its profit fell 20 percent. Whether the sacrifice was worth it is yet to be seen. Regardless, the grocer looks far different than the original shop on Pearl Street. Two major grocers plan to open new flagship stores in the coming weeks, according to reports. Albertsons is planning to open the doors to its latest Market Street location in Meridian, Idaho on March 9, and Whole Foods will open a 70,000 square foot store in Atlanta on April 5. 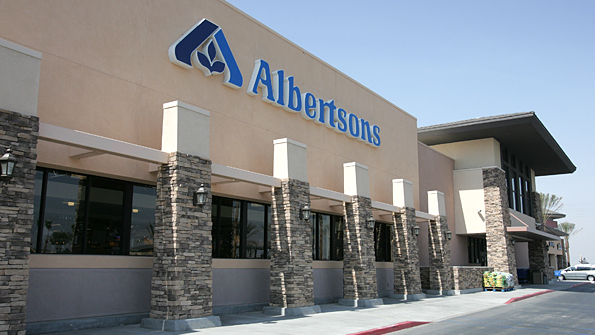 Market Street will be Albertsons’ second experienced-focused store in the Boise metro area. The new location is more than 100,000 square feet and will feature scratch-made bakery items, meats smoked and roasted in house, a live lobster tank, an oyster bar and an on-site dietitian to offer wellness advice. In Atlanta, Whole Foods’ new “south region flagship” location will include four fast-casual eateries, a rooftop bar, an old-world style butcher and a section where customers can get cut-to-order fruits and vegetables. This will be Whole Foods’ 500th store. Despite their strength as e-commerce providers, both Whole Foods and Albertsons have made it clear with these flagship stores that the in-store experience matters, and that brick-and-mortar grocery is going to continue to evolve. Amid the growing importance of online grocery, these retailers, and others like Hy-Vee and Raley’s, still see value in creating a memorable store experience — and are building stores more elaborate than ever before to draw foot traffic and strengthen enthusiasm for their brands. Whole Foods reaching 500 stores is a notable milestone, and the lavish Atlanta location shows that Amazon is committed to investing in the banner both to win with customers and expand its physical capabilities. It also reiterates Amazon’s desire to boost its brick-and-mortar footprint as the company prepares to open more Whole Foods stores this year throughout the U.S. According to recent earnings, Albertsons is performing well, showing that customers are embracing the retailer both offline and online. The company has advanced its tech and e-commerce efforts lately, testing frictionless grocery shopping and automated fulfillment and also partnering with Microsoft. The company hasn’t neglected the physical retail experience, however. In addition to the new Market Street store, Albertsons has increased investment in its private label brands and embarked on store remodels. A slowdown in physical expansion among grocery stores has taken hold in the past couple years. But while some grocery banners are struggling, discount and natural grocers have hit the gas pedal on expansion as they see an opening to steal market share and appeal to more shoppers. In December, Giant Food reported a $175 million investment to open new stores and remodel existing ones. Lidl, which struggled in the U.S. early on, may have gained its footing and plans to increase its store count in 2019. Fan favorites Wegmans and Trader Joe’s each have a handful of store openings on deck this year as well. 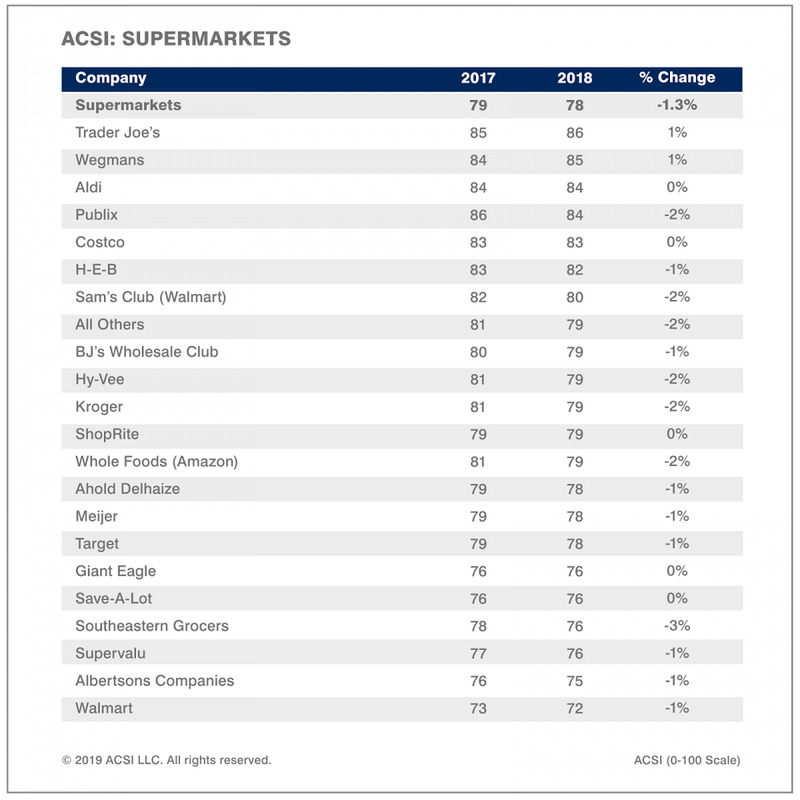 In all categories that ACSI records in their Customer Experience Benchmarks, all but one – “convenience of store location and hours” (which is ranked as the highest experience) dropped by at least one point over the 2017 ratings. 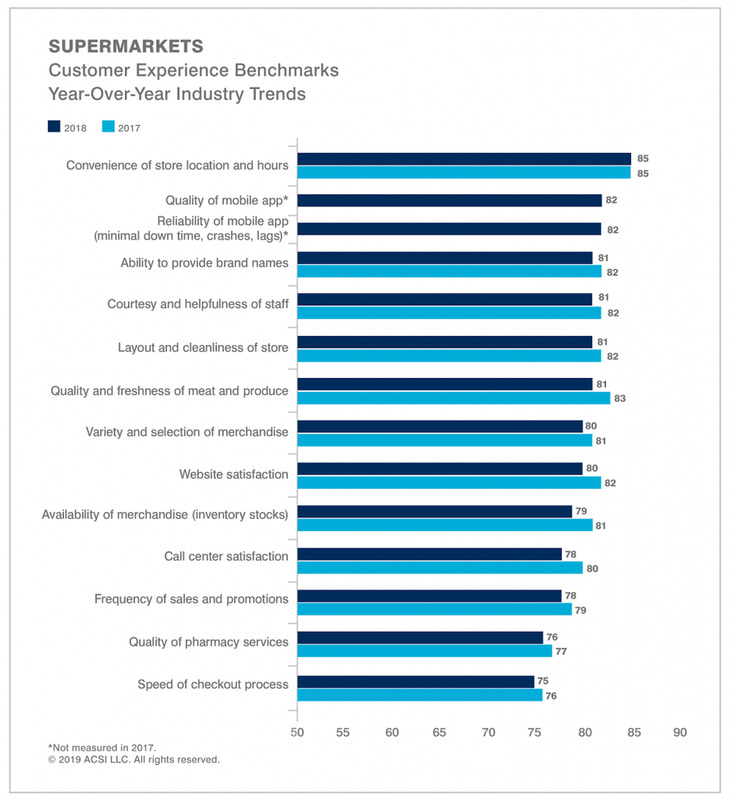 For the 2018 report they have added two new benchmarks: quality of mobile app and reliability of mobile app (both receiving scores of 82 – tying for the number two highest-ranking experiences in supermarkets. Reinforcing the emerging preference of using mobile devices to shop for food. Workers of Walmart de México, with the support of the Revolutionary Confederation of Workers and Peasants (CROC), called on the retail chain to strike for March 5. Through social networks, workers of the company, specifically the Walmart stores, Sams Club and Bodega Aurrera, say they started a movement to claim their rights. “We have started a movement to reclaim our labor and human rights with the strong support of the CROC throughout the country” says a video attributed to workers of Walmart de México. “Stop low wages, unjustified dismissals, discrimination, abuse, sexual harassment,” says the video where there is no mention of Superama chain stores, which is also owned by Walmart de Mexico. In the message, workers warn that if there is no response from the company led by Guilherme Loureiro, they will have to go on national strike next Tuesday, March 5 at 12 noon. Talks between United Food and Commercial Workers and King Soopers have broken down, but shoppers shouldn’t notice an interruption to service at stores in Colorado. The union said Monday that workers in the UFCW Local 7 are withdrawing a contract extension with all unionized King Soopers and City Market stores in Colorado as of 1 p.m. Monday. The withdrawal affects 109 King Soopers and City Market stores throughout the state. The 12,200 represented employees will remain on the job for now, but certain provisions of the parties’ collective bargaining agreements will cease. Wages and benefits will remain unchanged. Local 7, which is the largest union in Colorado, has been negotiating with King Soopers and City Market since mid-December over new collective bargaining agreements. The current agreements began expiring on Jan. 12, but were extended indefinitely by mutual agreement. This extension has now been withdrawn. The parties made little progress in the negotiations since December, disagreeing on issues including two-tier benefit discrimination, workplace safety, overtime protections, benefits for victims of domestic abuse, experience credit for those who have served and are serving in the U.S. military and whether sick grocery workers should be compelled to work. 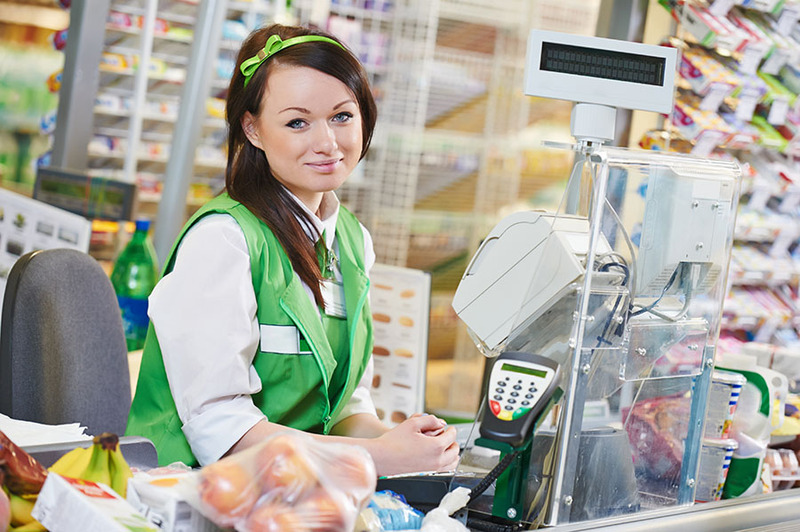 The withdrawal does not affect union workers at Safeway and Albertsons stores in Colorado and Rock Springs, Wyoming, who are also represented by Local 7. Their contracts remain in full force under an extension agreement. A union representing thousands of Stop & Shop workers in Massachusetts has voted to authorize a strike. UFCW Local 1445′s vote Sunday allows the union to call a strike if the contract dispute with the supermarket chain continues. The union is asking members to keep working while negotiations continue. The fight centers on health insurance, pensions and vacation time. The union says Stop & Shop is looking to “degrade the quality of life” of workers. If you think this is going to be yet another column admonishing you for not doing enough to curb the amount of single-use plastic in our waste stream, you can relax. You don’t need a lecture at this point. You might already know, for instance, that global consumer culture has generated more than 8.3 billion metric tons of plastic since the middle of the last century, and that we currently produce 300 million tons of it a year, half of which is made up of items used only once. And you’re probably aware that roughly 8 million metric tons of this discarded plastic ends up in the ocean, where it threatens marine life of all kinds. It’s unlikely anyone needs to tell you that every year we throw enough plastic away to circle the planet four times, or that a mass of plastic waste floating in the middle of the Pacific Ocean is three times the size of France. So instead of piling on to the guilt you probably already feel, allow me to offer a glimmer of hope. Increasingly there are signs—not big ones, but signs all the same—that a new generation of businesses and manufacturers, and even some of the older ones, are ready to change the way products are packaged and delivered so that single-use plastic is all but removed from the equation. Right now, these companies’ actual impact on the waste stream is small. But if their solutions catch on and become the norm, the impact could be tremendous. 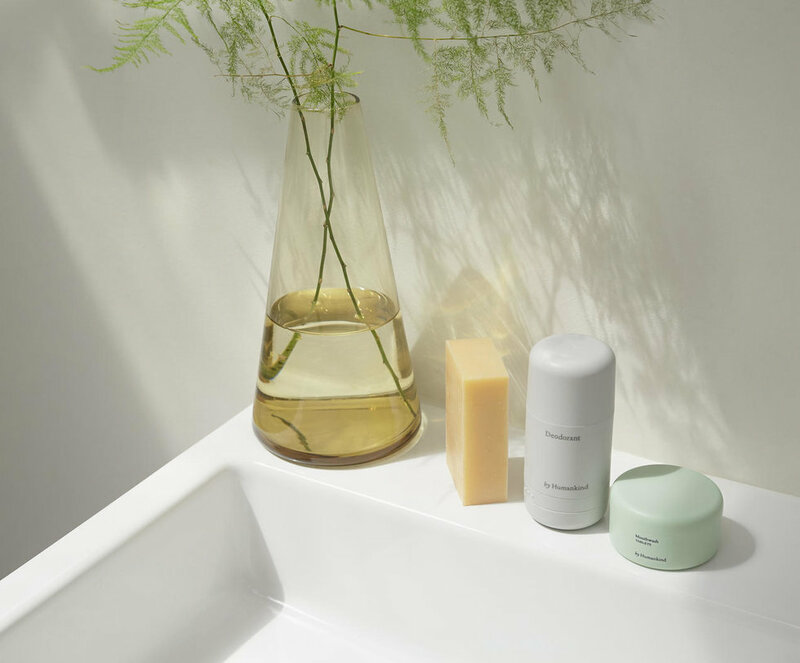 Last week brought news of a start-up called byHumankind, which delivers a variety of personal-care products directly to the doors of its online customers. At first glance, this doesn’t appear to be anything particularly new. But what is novel is the role of plastic in this most familiar of transactions. It’s practically nonexistent. Mouthwash comes in the form of a tablet that dissolves in water. Shampoo comes in a bar, like soap, and arrives wrapped in paper. Deodorant is delivered at first in an elegantly designed plastic container—but refills come paper-wrapped and ready to be popped into the original holder, turning what would typically be single-use plastic into something that can potentially last for years. Another new startup, Loop, carries out its mission of reducing plastic waste by leveraging the popularity of other brands. Its creators describe Loop as a “circular shopping platform,” which sounds oh-so-disruptive but is actually just a fancy way of describing what used to be relatively common only a few generations ago, when the milkman would come around delivering fresh milk in glass bottles and collecting the empties from the previous week. Loop has updated this admittedly quaint-seeming idea for the modern era. 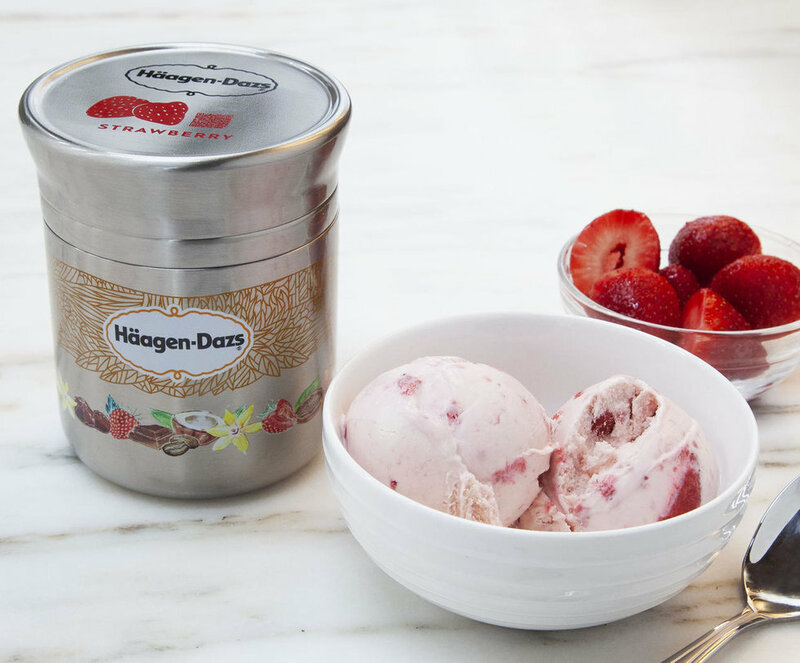 A wide range of products from big-name personal-care, household, and food and beverage brands come to you in durable, reusable containers. When you’re finished with them, you can either ship the containers back to Loop or schedule a pickup. That triggers the next shipment to come your way. Once returned, your discards are sanitized and refilled with products to be sent out to another customer, posthaste. With their emphasis on refillables and circular shopping, byHumankind and Loop join a vanguard of young, forward-thinking companies that are building sustainability into their business models, rather than simply offering customers a “green option” or vowing to reduce the carbon footprints of their operations and supply chains. 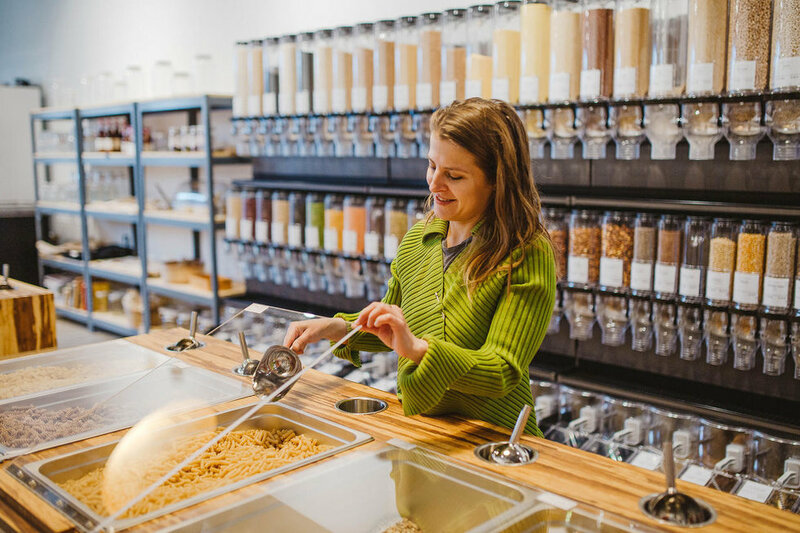 This movement also includes zero-waste, packaging-free grocery stores like Brooklyn’s Precycle or Idaho’s soon-to-open Roots Zero Waste Market, where customers bring their own containers and buy items loose or in bulk. This new wave of entrepreneurs are banking on the idea that consumers are sick and tired of feeling like they’re hastening the end of humanity every time they buy hair conditioner or yogurt. Whether their hunch is correct remains to be seen. (Zero-waste groceries can prove to be a tough selleven in famously progressive cities like Austin, Texas.) But certain retailing and cultural phenomena—online shopping, direct-to-consumer delivery, improvements in storage and shipping technology, and a growing environmental awareness among millennials, whose proclivities guide the decisions of some of our biggest brands—are definitely converging in ways that make it easier to opt out of plastic packaging. Today, sure, it’s just a noteworthy trend. But with the right timing and the right amount of public buy-in, today’s trend might actually become tomorrow’s industry standard. Dave’s Market, a grocery store that’s been a household name in Cleveland for nearly 90 years, is opening a new location in Cleveland’s Midtown neighborhood, according to a release from the company. The new market, located at 1929 East 61st Street, will feature a food court style eatery with access to fresh food options. The 55,000-square-foot market and eatery sits northeast of University Hospitals Rainbow Center for Women and Children, along RTA’s Healthline route. Among the features in the market, there will be a food court style eatery with lunch and dinner options, as well as takeout, featuring hand-rolled sushi, Cleveland’s Maha’s Falafel and Japanese hibachi. Also, customers can still get the classics from Dave’s such as fried chicken and subs. Inside the space, Dave’s and UH are partnering to create a teaching kitchen, which will serve as an instructional space where organizations across the city and general public can host classes and events focused on healthy eating. A drive-thru pharmacy will provide convenience, along with a First Federal of Lakewood bank branch opening in the spring. The new grocery in Cleveland’s Midtown neighborhood is one of many stores that Dave’s Market has built over the years. Tracing its roots back to 1930 with the location on Payne Avenue. Burt Saltzman, a third generation grocer, along with his two sons Dan and Steve, grew the business to 14 stores throughout Northeast Ohio, according to the release. The Payne Avenue location will close its doors on Sunday, Feb. 24 before the opening the new location on East 61st Street, according to a spokesperson for Dave’s. Dave’s is in the process of finalizing a transportation plan for customers from its former Payne location to the new store. The shuttle will pick up residents at two locations in the neighborhood and will take them to the new location where they will have an hour to shop. It’s unclear at this time where those two locations will be, but a spokesperson for the market says they will relay the information to its customers. The store will open at 10 a.m. on Feb. 27. The market and eatery will open daily 7 a.m. to 9 p.m.
A labor union issued a warning on a possible impasse in contract negotiations for more than 30,000 Stop & Shop workers it represents in New England, with the current contract slated to expire on Saturday. The sides have been in negotiations since mid January, with the United Food & Commercial Workers stating on Thursday that Stop & Shop has failed to offer improved benefits for workers, a possible sticking point. UFCW has begun an online ad campaign asking Stop & Shop “to do what is right for workers, customers and the community” in the union’s words. In a late-January update for members, UCFW characterized the company’s stance as “the same old doom and gloom that we heard three years ago” in negotiations for the current contract that reaches its sunset on Saturday. A subsidiary of Aholde Delhaize, Stop & Shop is the largest supermarket chain operating in southwestern Connecticut, with more than 20 stores. 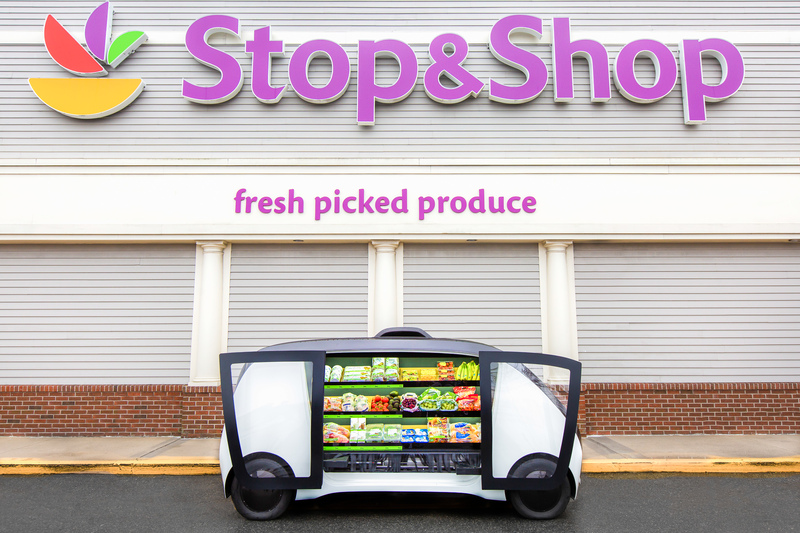 In a corporate statement, Stop & Shop took the stance that any agreement “must reflect the rapid changes and increasing competition that are reshaping our industry” in its words. Ahold Delhaize chose its Hartford area stores for renovations it will roll out across its footprint as it tries to make shopping easier and promote fresh, healthy foods. “The first 20 stores are done in the Hartford, Conn. area, and the first feedback of customers is very positive,” said Aholde Delhaize CEO Frans Muller, speaking in November on a conference call. “In the Hartford area if you take a visit there, we have a very strong, fresh produce … proposition which will create a lot of traffic.